​The approach to the altar. The priest receives this answer bowing, and goes down to the lower step, where, standing at the left side, he makes his confession. Priest. Our help is in the name of the Lord. Server. Who hath made heaven and earth. I confess to Almighty God and to you brethren that I have sinned exceedingly by my fault, through pride: in thought, word, deed and omission and I ask Blessed Mary and all the saints and you, brethren, to pray for me to the Lord our God. Through the intercession of Blessed Mary and all the saints may Almighty God have mercy upon us, forgive us our sins, and bring us to everlasting life. R. Amen. I confess to Almighty God that I have sinned exceedingly by my fault, through pride: in thought, word, deed and omission and I ask Blessed Mary and all the saints to pray for me to the Lord our God. May Almighty God have mercy upon me and through thine intercession, O most loving Mother of God, and all the saints, may my sins be forgiven and may I be led to everlasting life. Amen. 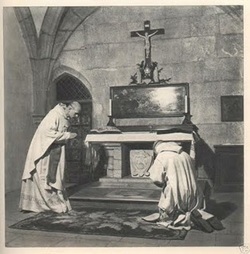 The priest, having bowed profoundly before the altar, prays in silence. Then he approaches the altar, in the middle of which, as a rule, he will stand through the whole mass. Said back and forth by the priest and server, or by the celebrant alone. Kyrie, eleison. Kyrie, eleison. Kyrie, eleison. Christe, eleison. Christe, eleison. Christe, eleison. Kyrie, eleison. Kyrie, eleison. Kyrie, eleison. may be said except in Lent and Advent. And, having bowed slightly, he prays in silence. Then, standing straight, he says the collect (Opening Prayer). The priest may read the the reading or readings turned toward the listeners, as also the Gospel. May the Lord be in my heart and on my lips, that I may rightly pronounce the Gospel of peace. Server . And with thy spirit. Priest. The continuation of the holy Gospel . . . The Gospel having been read, the priest venerates the book with a kiss. At the words that follow, up to and including “and became man”, all bow. who proceeds from the Father and the Son, who with the Father and the Son is adored and glorified, who has spoken through the prophets. From the side of our Lord Jesus Christ came out blood and water unto the remission of sins. I shall wash my hands among the innocent, and encompass thine altar, O Lord. That I may hear the voice of thy praise: and tell of all thy wondrous works. In a spirit of humility and with a contrite heart may we be taken up by thee, O Lord, and may our sacrifice be made in thy sight today in such a way as to please thee, O Lord God. He puts the chalice back on the corporal, and in front of it the paten, holding the bread to be consecrated. He covers the chalice with the top part of the corporal. A. And with thy spirit. C: Lift up your hearts. A. We lift them up unto the Lord. C: Let us give thanks unto our Lord God. A. It is meet and right so to do. C: It is very meet, right and our bounden duty, that we should at all times and in all places give thanks unto thee, O Lord, holy Father, almighty everlasting God. Holy, holy, holy, Lord God of Hosts, heaven and earth are full of thy glory; glory be to thee, O Lord most high. + Blessed is he that cometh in the name of the Lord. Hosanna in the highest. We offer them unto thee, first, for thy holy catholic Church: that thou vouchsafe to keep it in peace, to guard, unite, and govern it throughout the whole world: together with thy servant N. our Presiding Bishop and N. our Bishop and all the faithful guardians of the catholic and apostolic faith. Remember, O Lord, thy servants and handmaids N. and N and all who here around us stand, whose faith is known unto thee and their steadfastness manifest, on whose behalf we offer unto thee: or who themselves offer unto thee this sacrifice of praise, for themselves, and for all who are theirs; for the redemption of their souls, for hope of their salvation and safety; and who offer their prayers unto thee, the eternal God, the living and the true. United in one communion, we venerate the memory, first, of the glorious ever Virgin Mary, Mother of our God and Lord Jesus Christ: as also of blessed Joseph, her most chaste spouse, and thy blessed Apostles and Martyrs, Peter and Paul, Andrew, James, John, Thomas, James, Philip, Bartholomew, Matthew, Simon and Thaddeus: Linus, Cletus, Clement, Xystus, Cornelius, Cyprian, Lawrence, Chrysogonus, John and Paul, Cosmas and Damian: and of all thy Saints; grant that by their merits and prayers we may in all things be defended with the help of thy protection. Through the same Christ our Lord. Amen. Which oblation, we beseech thee, O Almighty God, in all things to make blessed, appointed, ratified, reasonable and acceptable, that unto us it may be the Body and Blood of thy most dearly beloved Son, our Lord (he joins his hands and bows) Jesus Christ. Who the next day before he suffered, took bread (he takes bread and holds it raised) into his holy and reverend hands, and (he raises his eyes) his eyes being lifted into heaven unto thee, God Almighty his Father, rendering thanks unto thee, he blessed, he brake, and gave unto his disciples, saying: Take and eat this, ye all. Likewise after they had supped, he taking this excellent Cup into his holy and reverend hands, rendering thanks also unto thee, blessed, and gave unto his disciples, saying, Take and drink of this, ye all. TO THE REMISSION OF SINS. As oft as ye do these things, ye shall do them in remembrance of me. He makes a profound bow, elevates the host, and bows again. Wherefore, O Lord, we also, thy servants, and thy holy people, being mindful as well of the blessed passion and resurrection, as of the glorious ascension of the same Christ thy Son, our Lord God, do offer unto thy excellent Majesty of thy own rewards and gifts, a pure host, a holy host, an undefiled host, the holy bread of eternal life, and the cup of eternal salvation. Vouchsafe thou also, with a merciful and pleasant countenance, to have respect hereunto: and to accept the same, as thou didst vouchsafe to accept the gifts of thy righteous servant Abel, and the sacrifice of our Patriarch Abraham, and the holy sacrifice, the undefiled host, that the high priest Melchisedek did offer unto thee. 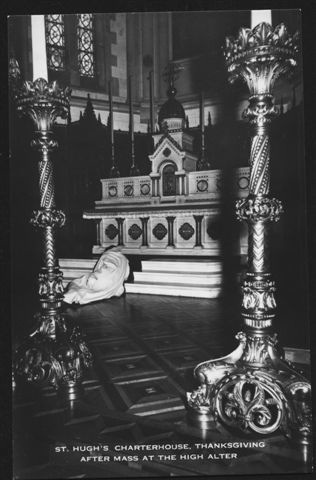 We humbly beseech thee, O Almighty God, command thou these to be brought by the hand of thy holy Angel unto thy high altar in the presence of thy Divine Majesty, that as many of us as of this partaking of the Altar shall receive thy Son’s holy Body and Blood may be replenished with all heavenly benediction and grace. Through the same Christ our Lord. Amen. which are gone before us with the mark of faith, and rest in the sleep of peace. [The priest prays for them briefly with joined hands.] We beseech thee, O Lord, that unto them, and unto all such as rest in Christ, thou wilt grant a place of refreshing, of light, and of peace. Through the same Christ our Lord. Unto us sinners also, thy servants, hoping of the multitude of thy mercies, vouchsafe to grant some portion and fellowship with thy holy Apostles and Martyrs; with John, Stephen, Matthias, Barnabas, Ignatius, Alexander, Marcellinus, Peter, Felicitas, Perpetua, Agatha, Lucia, Agnes, Cecilia, Anastasia, and with all thy Saints, within whose fellowship we beseech thee to admit us, not weighing our merits, but pardoning our offenses. Through Christ our Lord. Through him, and with him, and in him, is unto thee, God the Father Almighty, in the unity of the Holy Ghost, all honour and glory. World without end. (elevation) Amen. Our Father, who art in Heaven, hallowed be thy name ; thy kingdom come ; thy will be done , as it is in heaven, so also on earth. Give us today our daily bread and forgive us our debts, as we also forgive our debtors ; and lead us not into temptation, but deliver us from evil. Deliver us, we beseech thee, O Lord, from all evils, past, present, and future: and by the intercession of the blessed and glorious ever Virgin Mary, mother of God, and of thy holy Apostles Peter, and Paul, and Andrew, and all saints graciously grant peace in our days: that assisted with the help of thy mercy, we may be always free from sin, and secure from all disturbance as we await the blessed hope and coming of Our Saviour Jesus Christ….. O Lord Jesus Christ, give us that peace, which the world cannot give. O Lamb of God, who takest away the sins of the world, have mercy upon us. O Lamb of God, who takest away the sins of the world, grant us thy peace. O Lord Jesu Christ, Son of the living God, who by the will of the Father, and the cooperation of the Holy Spirit, hast through thy death given life unto the world: deliver me by this thy most sacred Body and Blood from all mine iniquities and from every evil: and make me ever to cleave unto thy commandments, and suffer me never to be separated from thee: Who with the same God the Father and the Holy Spirit livest and reignest God, world without end. Amen. Let the partaking of thy Body, O Lord Jesu Christ, which I, unworthy presume to receive, turn not to my judgment and condemnation: but of thy goodness let it avail unto me for protection of soul and body, that I may receive thy healing: Who livest and reignest with God the Father in the unity of the Holy Spirit God, throughout all ages, world without end. Amen. Bowing slightly the priest receives the holy body of Christ, the paten having been put under his chin. Then holding the chalice in his right hand, and putting the purificator or patena under with his left, he receives the Blood of the Lord. Communicating any others he says : The Body of Christ. Serving the Chalice he says : The Blood of Christ. After that, silence is kept for some time. R/ And with thy spirit. Let us bless the Lord, alleluia, alleluia. Holy Trinity, one God, may the offering of my servitude be pleasing to you : and grant that this sacrifice of praise, which I, an unworthy man, have offered in the signt of thy divine majesty, be pleasing unto thee : and that it be profitable for me and for all for whom I offered it unto eternal life, by thy mercy. Amen. He kisses the altar makes the sign of the cross with any persons present. An anthem of Our Lady may be said or sung.